The Sussex Trug is a funny old place to start my Traditional Craft journey around the British Isle’s because some would say; it isn’t actually that old, especially in traditional craft terms, having first shot to fame in 1851. But the trug is so very much associated with Sussex and is so firmly rooted in my childhood memories, it seems a very good place to begin. There have been Trug’s in Sussex in one form or another since way back when. The word trug is thought to have derived from the Old English word trough or trog which means ‘made of wood’ or ‘boat like form’. The first trough’s or trog’s were carved, wooden, boat shaped vessels and were used by farmers for measuring and harvesting and there are references to them in medieval manuscripts. But what is a bit hazy is when these solid wooden Trog’s evolved into the baskets we now know as Trug’s. It is known that a sixteenth century Sussex trugger called John Edwards left all his trugger tools to his son and the tools are almost the same as the trugger tools used today and trug’s also appear in paintings as far back as the 1700′s. However the Trug really came into its own during the 1800′s, In a village called Herstmonceux (Yes I know, it is a funny name! It’s pronounced Herst-mon-zoo and it comes from combining the Anglo-Saxon word hyrst, which means “wooded hill” and the name of the Monceux family, who were lords of the manor in the 12th century) lived a Mr Smith. It seems that Mr Smith had the bright idea of taking the original trug and making it better. Some say that he actually invented the Sussex Trug, it but it was more likely he was a master trug maker and he made the best trugs in the village. We do know his trug were made in the traditional Sussex style; a lightweight basket made from Sweet Chestnut and Cricket Bat Willow. The Sweet Chestnut, grown locally on the wooded hills, he used for the rim and handle and the Cricket Bat Willow, from the nearby Pevensey Marshes, he used to make boards for the body of the basket. Mr Smith’s Sussex Trug was very popular locally and he developed a thriving market selling to local farmers. The really big moment in Sussex Trug’s history came in 1851 when Mr Smith took his basket to the Great Exhibition of 1851. There, his stall was visited by Queen Victoria who order a number of Trug’s to give as gifts. The Sussex Trug was renamed the Royal Sussex Trug and Mr Smith personally walked all the way to Buckingham Palace, pushing his hand cart, to deliver the Queens Trug’s. Obviously Mr Smith was a very happy man, his business flourished and a trug making cottage industry developed. Competitors sprung up and trug making spread throughout Sussex and Kent and even as far as Somerset. Everyone chugged along quite nicely and the trug continued in production into the early twentieth century until, alas, along came mechanisation and plastic. Now here is where the story could have ended, the lovely Royal Sussex Trug killed off by machines and plastic, luckily for us it isn’t the end. Admittedly things got a bit hairy for Trug making for a while, farmers no longer needed Trugs to collect their eggs and apples and the plastic punnet became the preferred container. After the Second World War Trug production gradually shrank back into Sussex until there was only a handful of companies left, one being the original Thomas Smith company. These Trug makers survived by pure tenacity and also by adjusting their marketing plan. Instead of selling mainly to farmers they begun to sell more to gardeners. 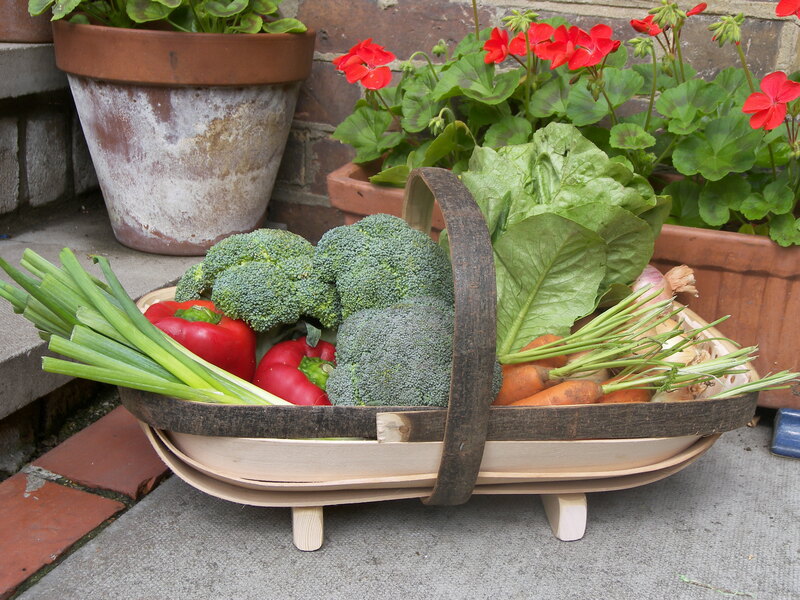 The Sussex Trug became the must have accessory for the dedicated gardener. So there we have it, a potted history of the Sussex Trug. Along the way the Sussex Trug really has had its ups and downs, through the seventies and eighties I remember more than one story about how the last trug makers were on the verge of shutting up shop. But it does seem they have now carved themselves a niche market. 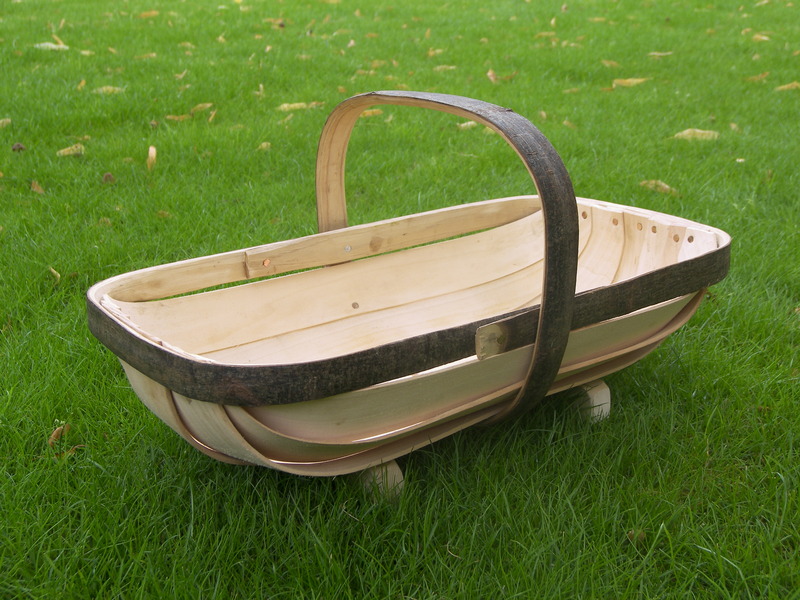 The Sussex trug makers have also diversified and now produce a ply version of the traditional trug. Go to any gardening online shop and the chances are that there will be a wooden trug of some description for sale. They now even have to fight off the threat of cheap, imported copies from China. However, the genuine article for me remains the Royal Sussex Trug, made only by the original Smith company. Although I must say if I am perfectly honest, I don’t think much of the music they play in their workshop, but despite the music – they make a jolly fine old Trug!! Next post is going to be on the Cumbrian Oak Swill. I am so loving this! In an age when we all moan about generic high street brands, it’s so great to focus on the regional crafts which are still alive and kicking. Think Cheddar Cheese and Cornish Pasty for the craft industry!! There are many places to buy Sussex trugs, some are made in Sussex and some are imported from Eastern Europe or China. It’s fair to say that the cheaper it is the more likely it is not to be a genuine Sussex trug. If you want to be sure that you are getting the real deal then The Cuckmere Trug Company is where you need to go, deep in the sussex countryside and bizarrely the workshop is also within earshot of Druzilla‘s zoo. So alongside the tweeting of blackbirds and sparrows you can hear monkeys and parrots too!